You have your own space. ben® has what you need to make it your home. 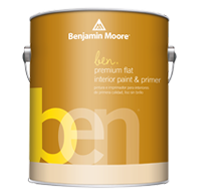 Available in three finishes, ben paint from Benjamin Moore allows you to create a style that's your own. This Zero VOC, low odor interior paint is an acrylic blended latex flat coating designed for application to a wide variety of surfaces. Produces a decorative and uniform flat finish with excellent hiding. Flat: The ideal choice for ceilings and walls with slight imperfections. Eggshell: A soft sheen that's more glow than shine works beautifully on most wall surfaces and cleans more easily than flat finishes. Perfect for busier areas such as hallways, family rooms, and kids rooms. Semi-gloss: The perfect finish for windows, doors and trim, providing a frame for flat or eggshell-coated walls. Starting at $42.99 per gallon, and $18.99 per quart.